The crops were laid down not broken off, at the ground level. In the paths the plant was laid down to the north, and in the circles the plant was laid clown in a counter clock wise motion. with the stalks parallel to one another. There was aprox. a three week difference in the maturity of the plant in the crop circle from what was out side the circle. In the center of each circle there was a divot in the shape of a bowl. and at the end of the most southern point. They were not holes. The plants in the circle looked to be sickly compared to the out side of the circle. They were discolored with black on the leaves and stalks. The community of Logan and Providence is a very observant and nosey community. So if this had been done by people they would have seen something and there was no evidence left behind by anyone.This pattern looks like a native American design or Petroglyph I have seen this pattern before. I still am searching for the pattern. This design is 240 feet long - It was found on Friday - August 23, 1996 by an 81 year old farmer in Logan, Utah on his wheat farm. His name is Seth Alder - while harvesting his wheat crop - his tractor broke down - so he began walking out of the field for help and came across this strange glyph. He contacted the Cache County sheriff's office and an investigation was begun. The local airport in Logan sent a plane over the field and picture/video cameras were used to capture this unusual glyph. After the investigation was completed - it was decided that it was made about a month earlier - when the wheat stocks were still green. One sheriff deputy said that maybe it was the work of gophers. There was no sign of anyone having walked in the field - as no wheat was found to be broken or stepped on - any place around the glyph. Dave Rosenfeld took this photo of lights or orbs at the 96' "GLYPH" Crop formation. This might be the first recorded event of the Cropcircle Light Phenomenon in the US. CACHE CROP MYSTERY: HEAVENLY OR HOAX? LOGAN-- Wheat farmer Seth Alder has spent his whole life worrying about what the rain and bugs do to his crops. On Friday, he was more concerned about visitors from another planet. That's because Alder, 81, found a mysterious design carved in his wheat field. And as far as he can tell, it wasn't made by anyone who got into the field on foot. No trail into the crop design was found. The only access was from above. "Well, you know, the scriptures tell of life on other planets," Alde said. Still, Alder's not committed to any flying- saucer theory. Seth called the Cache County Sheriff's Office, hoping it could solve the puzzle. Sgt. Mark Olsen and Deputy Kari Thurgood investigated and drew a diagram of the crop circle in their official reports. The design looks like a long-necked, long tailed turtle on skis. The investigation revealed the damage happened about a month ago when the wheat stalks were still green. They were flattened, but not cut. The design is not visible from the nearest road, which is about 400 yards away. One piece of evidence-- a hole in the center of a circle, made it look like someone planted a pole in the field and then, with a rope attached to the pole, mowed down the wheat in a circle. But the deputy and her sergeant couldn't figure out why there weren't any tracks into the cropcircles, located near the intersection of 1200 south and Highway 165. A trail visible from the air Saturday was made by Alder and sheriff's investigators. "Whoever or whatever did it spent some time on it," Olsen said. "Unless it was a big machine that sat down on it." On Saturday, some human visitors to Alder's wheat field needed only a few minutes in the the crop circle before they were convinced something made a galactic pit stop in Logan. "It looks like the spaceship just landed out here," said Judy Cobia, a 53-year old Honeyville resident who drove to Logan to see the cropcircle. Skeptical observers of the cropcircles in England, where the phenomenon has gotten the most publicity, say they are certainly human-made. 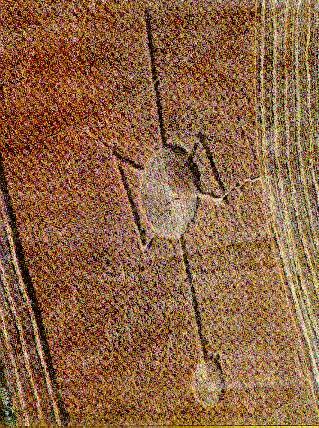 In 1991, dozens of cropcircles were discovered all across England, leading many to speculate about alien visitors. Two men later came forward and confessed. They ad used a rope and two boards to flatten the wheat in neat, near perfect circles. Even if the Logan crop circle is a hoax, some neighbors think it is still manna from heaven. Don and Dotie Searles, who own Kate's Kitchen across the road from the wheat field, have already come up with a slogan to attract hungry sightseers. "You know what they say? The food at Kate's Kitchen is out of this world," Don Searles laughed after spending Saturday afternoon inspecting the circle. Great Western Aviation, at the Logan_Cache Airport, provided two charter aircraft Saturday to fly photographers and reporters from the Herald Journal in Logan and The Salt Lake Tribune over the wheat field. The 1996 crop design was still visible a year later. 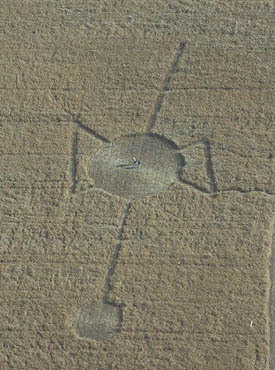 The Largest Data Base on Utah Cropcircles on the net!